Which Tourniquet Should I Choose? Severe bleeding is bad. “Bleeding out” can occur in less than 5 minutes. Average response time for EMS in the USA? 8 minutes. This is a strong argument for carrying a tourniquet on your person, every day. It can’t stop everything, as it’s only useful on extremities (arms, legs), but it’s still quite useful. It’s also been awesome to see tourniquets gaining more mainstream attention. For example, at the 2013 Boston Marathon bombing, tourniquets were used and reported on by the mainstream media. At the 2017 Ariana Grande Manchester attack, people used tourniquets to save their own lives. But there was one problem? They were all improvised tourniquets. Yes they were better than nothing, but it’s well-established that purpose-built tools perform better than improvised (it’s why you might be able to use your shoe to pound the nail into the wall, but a hammer works better). Presently, I carry a SOF Tactical Tourniquet Wide (SOFTT-W) from Tactical Medical Solutions. I carry it in a PHLster Flatpack TQ Carrier. The other big choice in tourniquets is the Combat Application Tourniquet (C-A-T). I’ve used both, including through scenario-driven classes with Lone Star Medics. Both are proven and TCCC approved, and really either one is fine. I came down on the side of the SOFTT-W for a few reasons. The metal windlass is nice, because plastics can degrade and break. Yes metal can too, but far less likely. The detachable buckle is useful, facilitating getting around things you can’t move. While you can pull the strap out of the C-A-T buckle, you then have to re-thread it, which is harder to do than simply latching the buckle. I have no problems putting that in an inner pocket in my cargo pants every day. It’s very easy to carry. During the Dark Angel Medical D.A.R.T. class I took, Kerry preferred the C-A-T, and we got to work with the new 7th generation C-A-T’s. I have to say, they weren’t as bad to work with as my past experience. Applying them one-handed was generally much easier than the SOFTT-W. That I could just pull through the buckle and hit the hook-and-loop closures ran smoother (and thus faster) than through the friction/tightening mechanism of the SOFTT-W’s buckle. I was able to get things tight and not have the TQ shift around on me, nor worry about “angle of pull” to get things tight. And of course, the big windlass retaining hooks on the C-A-T are so simple to use. That is one thing that’s hard with the SOFTT-W in one-handed operation: getting the windlass into the retaining triangle. I think the SOFTT-W’s retaining mechanism is more sturdy and provides better retention, but for sure it’s not as easy to engage. But I did say generally easier. I have larger and longer legs. Trying to apply the C-A-T around my legs wasn’t easy, because that great hook-and-loop that holds holds always. So when the TQ is staged, the loop isn’t big enough to fit around my legs – plus I have to thread it all the way up my leg. Else I have to rip the hook-and-loop apart, then pull the strap out of the buckle, then thread it back through. OR I have to stage it with a very large loop, but then it became more difficult to apply to smaller diameter areas like an arm. It’s something I’ll continue to work with to see if I can find a happy medium. but it still won’t be as flat as a SOFTT-W. Also notice that if you do flat fold it, there are some issues you have to work with on deployment – will you remember that under stress (and blood loss)? In the end, I’m a little more open to the C-A-T, due in part to the 7th generation improvements. One TQ that Kerry Davis (Dark Angel’s honcho) brought out was the SWAT-T. If you will, it looks like a long, wide strip of rubber. Just wrap it around and go. There’s some controversy about this TQ, questions of efficacy. Kerry sells kits that only have the SWAT-T in it, and he said to me that he would have no problems if that was his primary and only TQ. No qualms, no reservations. So take that as you will. To me, the jury is still out. There’s information, but not enough for me. But that said, one thing I found compelling about the SWAT-T is versatility. It can be used as a TQ, or it could be used as a bandage or pressure dressing, along with other uses limited only by your imagination. That sort of versatility can be welcome when you have only so much room for gear, but have to fill a lot of roles. Plus, the SWAT-T, in its original packaging, is much smaller than the C-A-T or the SOFTT-W. However, life has taught me that when you need the best, unitaskers – things that specialize, focus, and strive solely to fulfill that role – generally work better than multitaskers, since the multitasker generally has to make compromises to fulfill the multiple roles. Life is often about tradeoffs, so trade as your context and risk-tolerance can afford. My EDC will remain a SOFTT-W in a PHLster Flatpack, because it’s proven and fits my every day carry. When I need to buy more TQs for other roles, like the larger kit in my truck, in my briefcase, around the house, etc – places where size/bulk aren’t much of an issue, I’ll probably add C-A-Ts to the mix. I’m not saying I’ll replace one with the other, but I’m willing to supplement. I find both the SOFTT-W and C-A-T to be strong, but still have their drawbacks; neither is perfect to me, but the quibbles are minor. And I might even see where a SWAT-T could fit in. I am not willing to make it a primary, but I could see it as a supplement in a kit. That it provides for some different uses can make it useful in a tight kit, including being a secondary TQ if needed. Get training. It could be from Dark Angel Medical or Lone Star Medics or another reputable source. Work with the equipment, see how they work, their strengths and weaknesses, their pros and cons. Figure which will work best in your situation, and realize that you may have multiple situations and they could require different solutions. Just don’t delay. You don’t get to choose when bad things happen in your life, and you don’t want your last 5 minutes to be wishing you had a tourniquet. Finally found a solution for carrying a tourniquet! It’s difficult to argue against carrying a tourniquet with you every day. But for sure, to carry one isn’t the easiest thing as good tourniquets (read: SOFTT-W or C-A-T) are bulky; the windlass is inescapable and forces particular constraints and realities. Over the years I’ve tried numerous solutions and they just have not worked FOR ME. I want to stress the FOR ME part. There are solutions out there that work for TQ EDC, like my buddy Caleb Causey of Lone Star Medics uses an ankle wrap. But in the summer I like shorts and sandals, and in the winter I like boots – none of these are conducive to an ankle wrap. So solutions here are very much a “for me” situation. About a year ago I picked up a PHLstr Flatpack Tourniquet Carrier as it looked to have potential as a solution. You can click through to read my impressions at the time, but the bottom line was simple: nice solution, but didn’t work FOR ME. The quest continued. But some months ago it dawned on me: I don’t need a carrier, I already have one in my cargo pants pockets. I had tried it in the past but the bulk factor was a problem. The game changer? Flat-packing. I started by NOT using any sort of carrier/restraint at all, just sticking it into my pocket. The cargos I tend to wear have some inner pockets and the TQ fit perfectly. Huzzah! I’ve been able to carry a TQ on my person everywhere I go, without much problem nor notice. Of course, an unrestrained TQ was a bit a problem because it would come unfolded. I was using a rubber-band, but Caleb cured me of that (good luck trying to apply that one-handed). So how to solve this? The problem has been with me. I removed the belt loops from the carrier. It’s now just the backing and the shock-cord. Since the backing is cut to precisely the same size as the flatpacked TQ, no real footprint issues. It still fits in my cargo pockets like a charm. It’s bound so it doesn’t become a mess, and it’s able to be deployed quickly. 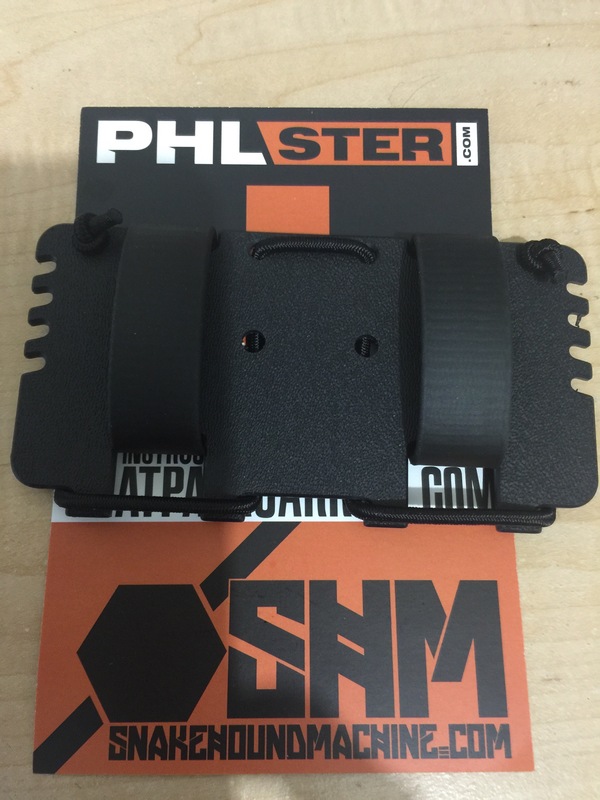 What follows is my (initial impressions) review of the PHLster Flatpack™ Tourniquet Carrier. So I blame Caleb Causey @ Lone Star Medics for all of this. 🙂 For some years now I’ve been trying to find a way to carry a tourniquet as a part of my every day carry (EDC). Alas, there’s been no good solution. Caleb’s preferred solution is an ankle-wrap, which is a fantastic solution. But it doesn’t work for me, because I like wearing shorts. Plus, enough heat, sweat, etc. and my skin starts to get irritated. So a solution like that just is not feasible for me. Caleb helped me look at a lot of solutions, such as various pouches, MOLLE, and various things. Alas, nothing really worked. Some time ago I found some excellent pouches from Eleven10 Gear. I do think they make some great TQ pouches, but I just did not find them workable for EDC. It’s not really the fault of the pouches, but of the TQ itself. Any good tourniquet, like a SOF-TT Wide or a C-A-T is just going to be of particular dimensions and constraints due to the windlass. If the TQ rides vertically, then it’s really tall and that windless is a stick in your back. And no one was really making horizontal solutions. For the record, I do still have my Eleven10 pouches and one rides in my range bag so I can keep one easily on-hand while working at KR Training. Again, fine products, but I just did not find them suitable for my EDC because it was either very uncomfortable, or the sheer dimensions and resulting thickness of the whole schebang was unconcealable. Oh, and I refuse to use any other sort of TQ because well… they just haven’t demonstrated effective. I defer to the expertise of folks, like Caleb Causey, on this topic. And personally, I prefer the SOF-TT Wide. The quest continued. I’d have a TQ somewhere, like in a bag, but those bags aren’t always in immediate proximity and that’s really what I’d like. So when Facebook auto-stalked a comment Caleb made to the BFE Labs page, it was one time I was thankful for Facebook’s auto-stalk “feature”. I immediately expressed interest, and the folks at BFE were kind enough to post some pictures to show dimensions and size. This PHLster Flatpack seemed to be the answer to my problems! It’s a simple thing, as you can see in pictures and video. And it should be able to accommodate your favorite big-windlass TQ. But yes, you MUST fold it a certain way to get the TQ to pack as flat as possible. PHLstr Flatpack™ TQ Carrier, and a S&W M&P9 magazine. That was the best part! On my belt, this was no thicker than anything else I already carried. Yes, it takes up more room because it runs horizontal, but it conceals just fine. And once you learn how to fold the TQ that way, you almost don’t want to ever fold it any other way. I think construction is generally good. Loops are made for 1.5″ belt and generally sturdy construction. I appreciate the use of the shock-cord and that there’s ways to adjust it because different TQ styles and fittings. BUT to me that’s also a potential downside: shock cord will wear out and eventually snap. Easy enough to fix, but having it decide to break while you’re out and about isn’t ideal. Not a knock against the design, just reality of using shock cord. I also worry that the attachments of the shock may come undone and release the TQ. So far not an issue, but I also haven’t subjected it to harsh stuff like rolling around on the ground, etc.. As well, the TQ is totally exposed — the only thing “protecting” it is your shirt. Is that going to be good? I mean, it’s a TQ… dust, dirt, etc. getting into it? other exposure. Or just simply friction wear from things rubbing against it all day? I mean, give a read to Caleb’s recent article about TQ failure. Is that going to be good or bad? vs. say a more covered “pouch” approach? But of course, the lack of pouch is what helps the slim design. So it’s a trade-off, and a design that I reckon is still to be vetted. Still, I appreciate these guys are trying to come up with something. I’m wearing it at the 4-5 o’clock position — it’s the only place I have room on my belt. My wife calls it my Batman Utility Belt because yes, I wear stuff all over it. Consequently, that dictated where I wore it because that’s the only place I have left. But in a way it’s good because that position was a “hole” and this balanced things out — especially when I leaned back into a chair. Generally I have no idea it’s there, and as I said before, it conceals quite well. But it’s not perfect. The nature of it wobbles; just how it’s built, attached, and the fact it’s cloth just bungied to a board. So sometimes when I sit down I have to reposition myself to get it to drop or shift to a more comfortable position. It’s a little harder if I lay down, and I do have to reposition myself until I get it placed more comfortable. If it was a full kydex (or leather or whatever) covering it, fixed attachments to the belt, etc. I wonder how this might change — tho it could change for the worse too because perhaps the flexibility helps find the right position. All in all tho I’ve been happy with the construction and approach, and it’s nice to know I’ve got something should I need it. I did find another snag — literally. I can’t draw. 😦 Because of my body shape, clothing, position on my belt relative to everything else… I can’t draw. I go to lift my shirt and the Flatpack (well, the TQ mounted on the Flatpack) perfectly snags my shirt almost every time and makes it impossible to lift up. I can get around it if I reach REALLY far back when I lift my shirt… or if I do things like lean backwards (towards 4:30 or so) so the shirt lifts at a different angle — but these are totally not feasible workarounds. And if it was a fully covered pouch it MIGHT help because it’d be smooth with rounded corners, but there’s no guarantee it wouldn’t have the same problem. So the solution here is carrying it in a different location, but I really can’t — the things on my left-back have to be there and can’t be relocated, and I can’t wear it up front. However, up front may be my only possible, but I’m not really hot about that for some reasons as to why AIWB isn’t working for me. This is the closest solution I’ve found, but it’s causing some serious issues for me. I don’t think the product is bad — I think it has a place and people should consider it for sure. I think ankle rig is really good because you can carry more than just a TQ — and to me, I think you really need more than a TQ, but then you need a way to carry it which generally means some sort of bag/kit on or about you. My briefcase is pretty stocked, but I don’t carry my briefcase everywhere. I think the Flatpack design is a worthwhile attempt. I think it’s going to need some time (read: years) to fully vet the design. People wearing it in daily carry, to more rough-and-tumble classes, and just really giving it a work-out to ensure this design is really going to work. I think there’s a lot of good things here, and frankly it may be the right solution for YOU. Consider what the product offers, what it is, what it is not, what your situation is, what freedoms and limitations you operate within. It may be right for you. If you’re not sure if it’s right, pick one up and give it a try because you really won’t know for certain until you do. As for me, I’m not willing to give up on it entirely, but I have taken it off my belt until I can think of a way to make it work for me. Been wearing another one (with a SOF-T Wide) for a little bit now. This morning at the gym I had a brief interaction with a couple members of the Austin Police Department. Seems a shop a few doors down from the gym was burglarized overnight. They came over to ask me questions (if I saw anyone, etc.). Very professional, very good interaction. I noticed on one officer’s duty belt a tourniquet! It looked like an Eleven10 Rigid case for a C-A-T. I briefly commented on it and was told “they all have them now”. (but I was only able to see the one on the one officer’s belt). I don’t know when APD started carrying tourniquets, and I don’t know if it’s department mandate, if the equipment is standardized (e.g. C-A-T only, SOF-T, their choice; the belt pouch, etc.) or what. But whatever with the details, it’s just very cool to see APD carrying tourniquets.